Появится диалоговое окно Edit, с помощью которого можно изменить отображенные значения. Примечание: Некалиброванные наконечники имеют звездочку передидентификационным номером в спискеActive Tip List. This is the permanent number that PC-DMIS assigns to a tip when it is loaded into memory. This field displays the probe type (BALL, DISK, TAPER, SHANK, OPTICAL). These values describe the location of the tip. This location is in relation to the bottom of the Z rail. These values describe the direction of the probe tip. This vector goes from the center of the probe tip towards the Z rail. These values indicate the most recent date and time the probe tip was calibrated. These values are available for viewing in the Edit Probe Data dialog box. If a new tip is created without being calibrated, PC-DMIS will display NEW for the date and time values. 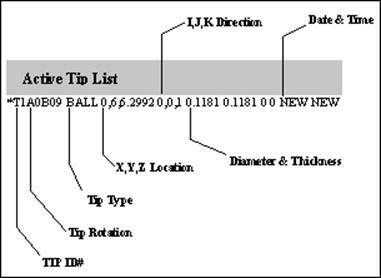 If an old probe tip is loaded and the date and time information is unavailable, PC-DMIS will display UNKNOWN for the values. Only probe tips that are actually calibrated have their time and data values updated. An asterisk (*) identifies any uncalibrated tips. · TipID#: (Идентификационный номер наконечника). Это постоянный номер, который PC-DMIS присваивает наконечнику при загрузке в память.